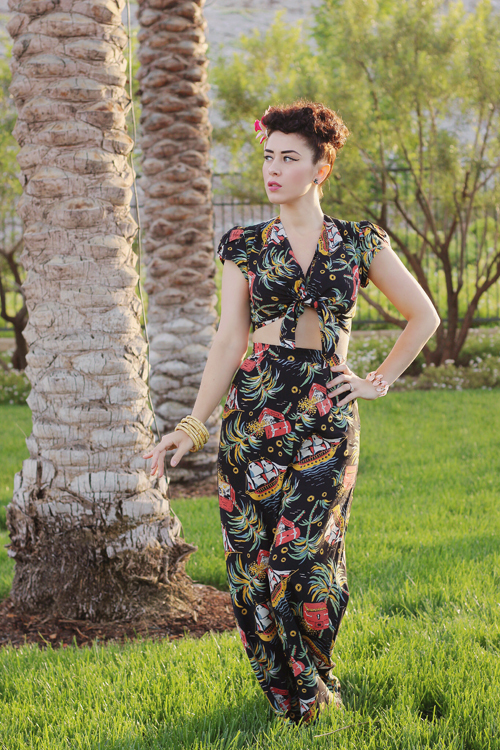 I know I gush about Trashy Diva all the time (I can't help it, they're my favorite vintage reproduction clothing company) but the new Pirate Treasure collection has me swooning! As someone who enjoys a fun novelty print but chooses to tone down on the kitsch, Pirate Treasure was the perfect match for evolving wardrobe. I'm incredibly excited to share this review of the Alexa tie top and lounge pants, which have quickly become my favorite go-to outfit. I mean, who doesn't want to wear lounge pants all the time? The advertised comfort is right in the name! Pirate Treasure is 1940's inspired novelty print which features pirate ships, treasure chests, palm trees, and gold doubloons on a breezy, flat rayon fabric. The combination of the coral, sage, dusty blue, and gold tones with the black background creates a tropical motif that feels subtle enough for everyday wear. The Alexa tie top is true to its name and ties up in the front. It's one of my favorites because it allows you to adjust it to a tailor-made fit every time. Thanks to the petal sleeves, I can lift my arms all the way up with ease. Might sound trivial to some, but this mom needs to be able to pick up her toddler without worrying about ripping her pretty clothes! I went with the size 2 in this top and it provided enough coverage without having any extra fabric. 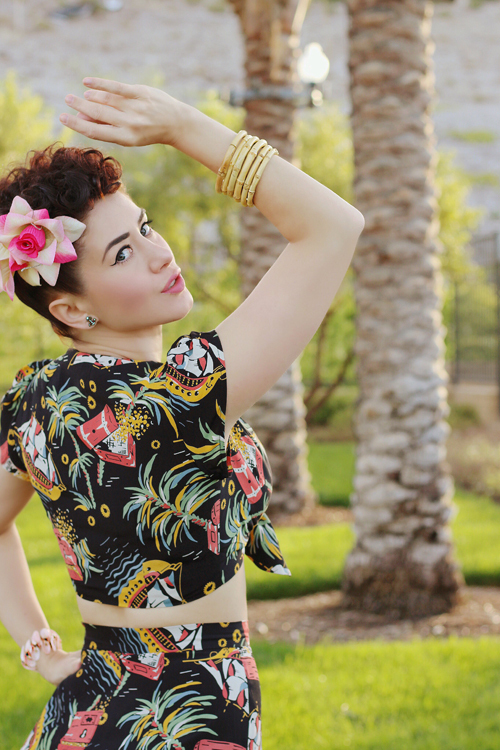 I can't wait to wear this top with the matching 40's skirt or my favorite pair of high-waisted jeans. It's just so versatile! This is actually my first pair of Trashy Diva lounge pants and I'm kicking myself for just getting into them! These high-waist pants feature a wide leg, lined waistband, and a side zip with a button closure. I'm just shy of 5'7" and these pants were perfect for my frame with flat sandals on. If I wanted to wear them with heels, there is about 2" of seam allowance to make them work. I went with a size 4 in the lounge pants (my normal TD size in bottoms) and it was a great fit. I might have been able to size down to a 2, but I prefer a looser fit in the waist on pants and needed the extra length. Here's to hoping we get more lounge pants in the future! The Pirate Treasure collection has ten different pieces: three tops, one skirt, one pair of shorts, one pair of pants, and four dresses. There is a perfect mix of both 40's and 50's styles and debuted two new styles (I purchased both of them). I added the June blouse, the 40's skirt, and the Hollywood dress to my closet; it's quite literally the most I've ever purchased of one collection. I have no regrets, this is one of my favorite prints/style options Trashy Diva has offered. Make sure you act quickly, Pirate Treasure has been flying off the shelves since it dropped on Thursday! But fear not, restocks have already been planned for summertime. Keep your eyes peeled for Pirate Treasure at Disneyland... You know I'm wearing it the next time I ride Pirates of the Caribbean!